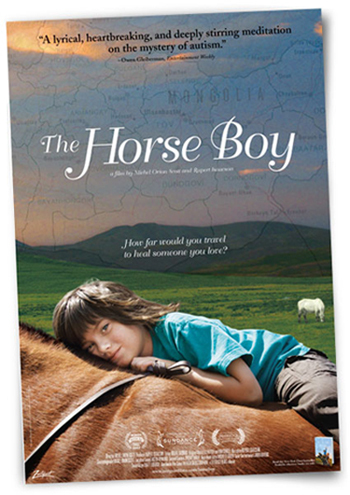 The Horse Boy does more than chronicle Rowan and his parents' journey across the vast, wild landscape of Mongolia. It delves into the strange world of autism itself, the relationship between humans and animals and between different cultures and different ways of being (autistic vs. normal, or "neuro-typical"), and the nature of healing. Audiences hear the varied theories on autism from the experts in the field, well-known researchers of autism such as Dr. Simon Baron-Cohen of Cambridge University; Dr. Temple Grandin, recovered autist and professor of animal behavior at Colorado State University; and anthropologist and researcher Roy Richard Grinker of George Washington University. But above all, The Horse Boy tells the story of a couple that goes to the end of the earth to find a way into their son's life. More and more films are being made about the vital role that fathers play in the development of their children. Society is entering a new era of parenting, when fathers, instead of being emotionally distant breadwinners, are stepping up to the plate of direct, hands-on parenting. The special bond between father and son is one of the greatest gifts life can offer. The Horse Boy tells this story.